A man who killed a father-of-two over a £20 debt and took a photo with his foot on his head has been jailed. Sean Doherty, 24, attacked Thomas Gravestock, 35, who suffered from 35 blunt force injuries, in August. Northampton Crown Court heard Mr Gravestock owed money to a friend of Doherty, who decided to give him "a kicking". Doherty, of Lincoln Way, Corby, admitted manslaughter and was jailed for seven years and two months. Northamptonshire Police said Doherty attacked Mr Gravestock twice in the space of two days at a property in Butterwick Walk, Corby, over the £20 debt. The force said he punched him repeatedly to the face on 21 August and then attacked him again in the early hours of the next day, when Mr Gavestock was stamped on, kicked and slapped. As Mr Gravestock lay unconscious on the floor that morning, Doherty took a photo of him with his foot on his head and sent it to others via text message, police added. Prosecutor John Lloyd Jones QC told the court: "It plainly took Tom many hours to pass away." A post mortem examination found Mr Gravestock suffered from 35 blunt force injuries which lead to him suffering from bleeding on the brain, a lacerated liver, and serious injuries to his chest and abdominal area. Mr Lloyd Jones said Mr Gravestock's death had been devastating for his parents, his partner and his children - a daughter aged 10 and a six-year-old son. He said his mother "feels she is broken and all enjoyment in her life has now gone". 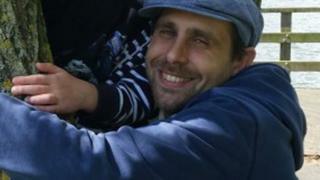 The mother of Mr Gravestock's two children said the death of their father has had a "colossal impact" on them. Det Ch Insp Ally White,said: "This was an extremely sad case which has left a little girl and little boy without a father and I hope Sean Doherty reflects on this during his time behind bars."